If you are visiting our page due to a recent transmission break down, performance discrepancy, or for maintenance services, keep reading or give us a phone call to help you with you inquire. Friendly front desk person will greet you and collect your contact information, symptom description and approval signature for diagnostic fee. $150.00. Then you vehicle would be taken to one of the auto lift bays to undergo a thoroughly analysis of the transmission system. 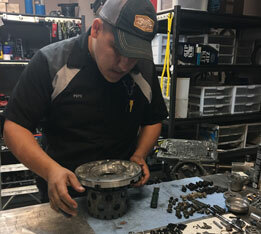 If needed, our technicians will perform test drives, removes transmission oil pan, check transmission hydraulic pressure & records data graph movie to condemn repair solutions. Diagnostic results are submitted for estimating repair cost. You will get a phone call, text, or email with the diagnostic results and repair cost. Once repair job is approved, turn around time is usually between 5 – 8 business days. During the repair progress, you will receive picture updates via text or email.